Carl Jurisch was a talented engineer, who built his own motor from scratch at age 24, as well as a lifelong motorcycle racer and enthusiast. With European motorcycling in decline in the mid-fifties, he became convinced that the future of transportation lay in a personal single-seat vehicle. He designed and built his little car using as a base the body of a Steib S250 sidecar, turned back to front, split down the middle and widened. 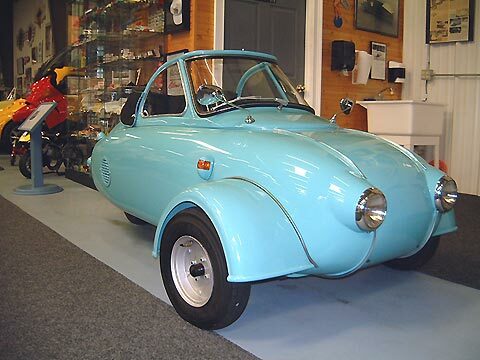 The windshield and front suspension is Messerschmitt, and the drive unit Heinkel Kabine 150 (175cc), but with 103A-0 Tourist carb and exhaust. The 8-inch rear wheel and shorter chaincase came from the Tourist scooter 102A-1. The unique steering, U-shaped handlebars pivoted under the seat, is a delight to use- light and precise. Handlegrips conveniently incorporate blinker switch and horn button. Canopy, tail, seat and fuel tank all pivot upwards for access. In conjunction with motorcycle dealer Joe Berliner, he tried to market the tiny car in New York City at the height of the tailfin craze, hugely misjudging the market from his vantage point in rural Germany. This car, the prototype number 101, ended up languishing in a Florida dealership, whereupon it was acquired by Vic Hyde and then, in 1994, brought to Canada for restoration. At least two more cars were built. The second, also blue, was given a taller more practical cabin and ten-inch wheels. The daughter of Carl Jurisch, recalls as a little girl getting rides on the tail of this car when the regular transport to the school in the next village (via the milk or post office trucks), weren't running. A letter from noted authority Dr. Paul Simsa recalls how Jurisch brought the car to the offices of "Das Motorrad" for a test but was refused because "who would buy such a silly impractical thing." The third car, painted red, featured a large box with lid in place of the shapely tail. The whereabouts of these two cars is unknown.